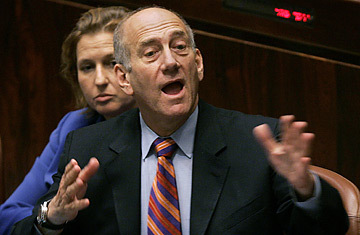 Israeli Prime Minister Ehud Olmert speaks at a special session of the Knesset, Israel's parliament, to discuss the Winograd commission report in Jerusalem, Thursday, May 3, 2007. Looking out at the 120,000 demonstrators gathered in Tel Aviv's Rabin Square to demand the resignation of Prime Minister Ehud Olmert, Israeli democracy appears to be alive and kicking. The protest was sparked by last Monday's report by the official Winograd Commission that was scathing in its critique of Olmert's disastrous leadership during last summer's war against Hizballah, which cost the lives of more than 150 Israelis. Even Hizballah leader Hassan Nasrallah  presumably in a bunker somewhere in Beirut  expressed his admiration for the Israeli government. "They study their defeat in order to learn from it," he said, unlike Arab regimes that "do not probe, do not ask, do not form inquiry commissions." But despite the health of its democracy, Israel appears unable to rid itself of a leader whom its citizens almost universally see as incompetent. Olmert shows no signs of being ready to quit, or of being forced out in the near future. With approval ratings as low as 3% even before the publication of the damning report, you might think the whole country would be up in arms for him to go. But the crisis over Olmert may be symptomatic of a deeper shift: The Israeli press and civil society groups have made much of the fact that the country is fed up with its entire political class. Once led by the giants of its founding generation, Israel is now run by a generation that rose through the ranks of backroom politics, and whose rise has been accompanied by the corruption scandals to prove it. Greater-good statesmanship has long ago given way to the petty power ambitions of career politicians, as their response to the current crisis seems to demonstrate. Not only is Olmert himself unwilling to do the honorable thing and resign, but his cabinet and the Knesset appears unwilling to risk their own jobs to force him out through a no-confidence vote that would bring new elections that put everyone at risk. "In old Japan, leaders would have committed hari-kari in such circumstances," said Yossi Offer, a volunteer with the Movement for Quality Government in Israel, an civil society group supporting the protest in Tel Aviv. "Our leaders our putting their interests before the public interest." The demonstrators seemed more dazed and confused than ready to mount a people power revolution, however. The coalition of 11 political parties that organized the event agreed on so little that they invited no politicians to address the rally lest any one speaker offend the others. But even the anodyne lineup of writers and pop stars wasn't enough to prevent controversy. Several crowd members shouted down performers because they thought playing music offensive to the memory of the soldiers killed in Lebanon. And Israel's vaunted security precautions were barely in place. A photographer and I strolled into the square without anyone checking our bags for weapons or bombs. Having covered massive demonstrations in Lebanon over the past two years, I couldn't help but think that Hizballah would never have run such a Mickey Mouse protest. Perhaps, however, the listless Israeli public shares some of the blame with its politicians for the current state of affairs. Thursday night  the beginning of the weekend here  was business as usual for most people in this beach city preparing for the summer season, unmoved by the protest in Rabin Square. "The country has already moved on," said a drinker next to me in a crowded bar on Ben Yehuda street. "No one cares about the war in Lebanon anymore." With suicide bombings down and the stock market up, much of the country seems blissfully undisturbed by the growing chaos beyond its security barriers and heavily guarded borders  and by the incompetence revealed by Winograd in Israel's corridors of power.